A megaload carrying an evaporator for a Canadian oil rig sits idle on on U.S. Highway 12 outside of Lewiston, Idaho, on Tuesday. Construction worker D.J. Skelton of Lewiston, Idaho, sits in his pickup checking out a megaload carrying an evaporator for a Canadian oil rig on U.S. Highway 12 outside of Lewiston on Tuesday. A megaload carrying an evaporator for a Canadian oil rig sits idle on on U.S. Highway 12. 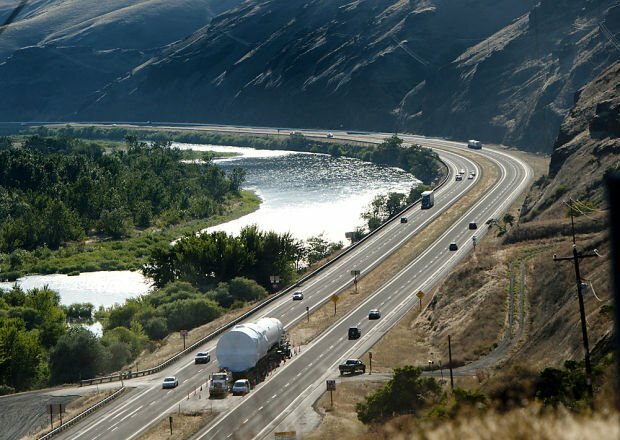 BOISE, Idaho – Federal forest administrators issued a closure order Wednesday for a section of U.S. Highway 12 through north-central Idaho that for now suspends all future trucking of big and wide loads. The order, signed by Faye Krueger, Northern Region forester, targets a 100-mile stretch of the roadway that passes through the Lochsa-Clearwater Wild and Scenic River corridor. The order also comes days after a federal judge in Boise blocked a second shipment of oil-field equipment that was scheduled to begin its journey across the state Wednesday, into Montana en route to Canada’s tar sands. 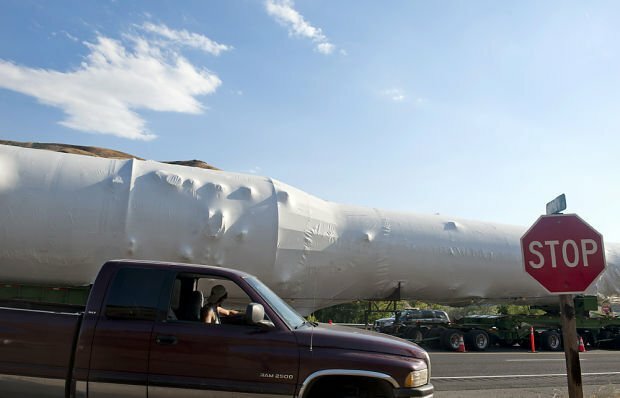 Oregon-based hauler Omega Morgan trucked an enormous 225-foot-long, 640,000-pound water evaporator along the route earlier this year, touching off protests from Nez Perce tribal members and others opposed to using the scenic highway for a megaload shipping route. The closure order is effective immediately and is in place until the agency agrees to lift it, most likely when forest officials complete a study on the impacts the shipments could have on the river corridor. The agency has also vowed to consult with tribal officials on the impact to treaty rights and cultural values. Under criteria spelled out Wednesday, the closure applies to any load that exceeds 16 feet in width, 150 feet in length or takes more than 12 hours to travel through the corridor. The closure begins just east of the town of Kooskia and extends to the Idaho/Montana border.